In the previous two articles in The African Boss Magazine, we mentioned how passion and determination are driving forces to success, and how support and relationships supplement that dedication towards achieving your dreams. But once you have passion, are determined, have the support from different relationships you have formed, what keeps you going? What keeps you dedicated and motivated? The first time I heard him say Everything we do in life is based on fear. I immediately asked “How so, Coach?” So he took some time to enlighten me on the Success Blueprint or The Playing Afraidd blueprint. 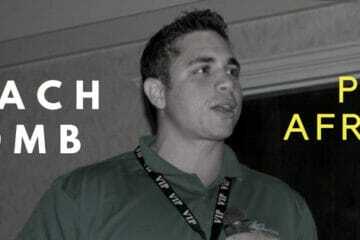 Coach Bomb is a life coach, professional speaker, and wrestling coach. When he was 10 years old, one of his wrestling teammates called him Adam Bomb and that name stuck and later became his professional brand name. To have a chance of winning, you need to be aware that you are in a competition ring and that you’re not alone in there. In short, be aware of your surroundings. Be aware of your goals. Be aware of your skills and weaknesses. On The African Boss journey, I have met some entrepreneurs that start a business without researching their market, niche, competitors, etc. It is always very admirable and highly recommended to take a leap and turn your business idea into reality. But when you are not aware of your surroundings or opponent, in wrestling, you lose a game, but in business, you get crushed and this usually results in massive loss of financial and time resources. So listen to Coach Bomb. Be aware of your market, surroundings, competition. Do a SWOT analysis. SWOT, another acronym that stands for Strengths, Weaknesses, Opportunities, and Threats, is a strategic planning technique that helps a business determine their competitive advantage in their niche by looking at what strengths the business has, what they do less than the competition, what opportunities are available to win over more customers, and what threats they should prepare for. The SWOT analysis will be elaborated in an upcoming article about strategic business planning so subscribe to learn when the article comes out. Before throwing that first shot in the game, Coach Bomb finds it very important to know why you are doing it. Let’s face it, for the average person not under influence of drugs or alcohol, it is not easy to decide to take a shot at someone. Coach Bomb has been sober for 16 years now and this helps him focus and be in control and stay healthy – qualities that he deems necessary to achieve your desired business goals. So when he is in the ring, he focuses on why he is there and this results in a greater focus on the task at hand. So before you go all in, you need to ask yourself why you started your business in the first place. I am not talking about just making money. Here you focus on a reason much bigger than money. Think deeper. If you have a successful business, there is an underlying reason much bigger than what’s apparent to the world. 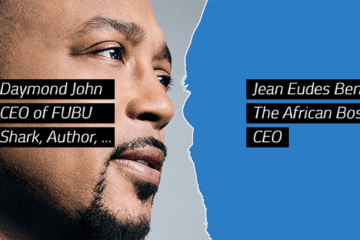 These deeper reasons that bring businesses to success are what we like to cover on The African Boss Journey in magazines, podcasts, and articles of entrepreneurs and businesses. In high school wrestling, a reason to take that first shot could be to train well enough to secure a college scholarship. Once you can focus on that, it is easy to see why it is important to take the shot. 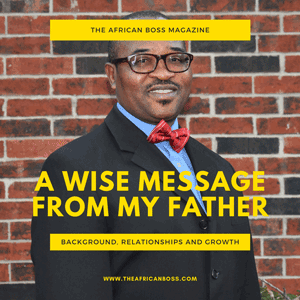 As a business owner, you could be wondering why you should invest in sharing your story in our magazine, or why you should redesign your website, or get your own business video promo, or update your social media, etc through The African Boss. But when you focus on how these business activities not only increase your competitive advantage, but also that the results of the hard work The African Boss puts in your advertising or the money you spend on that comes back as more recurrent revenues for your business and many potential clients reached by your business, it becomes clearer why you should check out our marketing services and what our previous clients have said about our work. In psychology, positive reinforcement is one way to encourage behavior repetition. Positive reinforcement in business comes as outside support, outside motivation, revenue, etc after your hard work. This reinforcement can come from within or from an accountability partner. In the ring, your teammates can give you a little push. In business, your relationships and other people who support you can be a great way to remind you why you are doing what you are doing. But although it is great to know someone you care about is very proud of your business success, it is very important to know that, unless they are part of your target market, their opinion and input on your business should not weigh as much as your target market. For example, my family rarely use social media. So, listening to their opinion on why the social media advertising services The African Boss provide are better than TV or other traditional media advertising platforms should not be valued as much as talking to an entrepreneur who has used traditional advertising platforms. But as said in the last article about family and relationships in business, we need support but it is hard for the right support to come by. So the best accountability person to help you stay in the game is yourself. You should be able to decide what the best way to get to your business needs is. For example, when The African Boss started, the idea was to have a business listing website and that was it. But as I realized that people do not like lists, forms, etc, I found that instead of listing businesses and their locations and what they do, sharing their stories would create a better connection to their target customers. And that is how The African Boss Magazine and TV were born. Be able to readjust your path to success to enable you to recommit to your main mission. Once your goals and the right path to success are clearer and you are self-supportive or have support from family and other relationships, it is time for you to take the shot. This is when you dive in and reach your market and start marketing your services and making sure the world knows about what you are offering. This stage uses all the skills you have learned over time. Your skills are put to the test and it is now just you and your competition in the ring. You have to act and take your shot. You have to be knowledgeable to establish a plan of action and go through with it. At this stage, in business, you budget, make cash flow plans, and go into live market research for your business. Know how much you need, when you need it, what skills you need, pricing strategy, how many employees it will take, etc. Elaborate your business plan and act on it. Your knowledge level is very crucial at this stage. If you go in with no plan and take your shot, you get knocked out faster than expected. The most crucial part is minimizing capital spent while keeping the highest quality you can provide. Because once you learn more about your market, you can then invest more in research and development to provide better services and higher quality for your clients. This is where Coach Bomb business coaching services and The African Boss marketing services can be important to help you take the right shot. But sometimes, you go in prepared and still get knocked out and that is where this next point comes in. At this stage, you have acted. Your intentions are clear and you know why you are doing what you do. But let’s face it, this might be a new venture or a new industry and sometimes, you might miss your goal. So what do you do if you take a shot and your opponent in the ring dodges it and takes a shot back at you and succeeds? You go down. And usually, your family and surrounding that supported you from the beginning are there to witness your downfall. Your bank account is low. You feel like a failure and you have let down some people that depended on the success of your business venture. What should you do? The easiest way out is to quit, right? All your troubles will go away and you can go back to where you started, working for somebody and letting them go in the ring and you watching them from outside the ring. But this is not you. This is not who you are meant to be. You left watching people play the game to transition to playing the game. You are a player now and business is your game. Get back up and keep playing. Going back to watching will never make you happy. You will always regret not pulling yourself back up and taking the next shot because you miss 100% of shots u never take like the popular saying goes. Keep pushing, who knows, that next shot you are about to take might be the one you need to knockout your opponent. What if you miss 50, 100, 1000 shots, etc, stay in the ring, keep pushing. But before each new shot, analyze what you did wrong, learn movements of your opponent that lead to your failure, learn your own mistakes that lead to your failure, constantly improve, go back and train and get back in much better. Improve your skillset and knowledge. Some people think they can keep doing the same thing over and over until it works. But I say, if a method doesn’t work, analyze it again, modify it to remove the mistakes you did and do it again but differently. We psychologically get better and faster at taking actions with repetition because of muscle memory. Let that fear motivate you and learn from past mistakes to become a better entrepreneur your business needs, the best player in your game because this next shot you are about to take might help you hit one of your milestones. When you are at a point of no return, you know you are dedicated. This is where you have gone through failures, adjustments, starting over, etc but are still standing. You have proven to succeed. You have learned a lot about your opponent, your market and surroundings and you are comfortable in this lifestyle and would never trade this life to go back out of the ring to watch. Your mindset has shifted from the dilemma between watching and playing to how to grow from where you are today to get to where you want to be tomorrow. You have better and specific goals at this point in time. When you started playing, your thoughts were still limited to throwing the first shot but now you have grown into a leader who is thinking about how to scale and make better lives for your employees, etc. Can you feel the mindset change? At this stage in your business, you have more to lose compared to when you started and business goals are not just dreams anymore, they are attainable, specific, measurable actions that you have begun to accomplish. This is when you are thinking of scaling your business larger, you have learned from the past, and you can act much more efficiently. Your company or business skillset has grown exponentially, and all you can do now is keep moving forward leading to this next point. At this stage in the game, you know your opponent, as a matter of fact, you have faced all your opponents’ strengths, weaknesses, opportunities, and threats and you can use your competitive advantage to win games no matter which opponent you are facing in your niche. You have faced a lot of threats and you have overcome most and you have done this over and over to the point when you can adapt to new situations easily. As a result of your experience, you keep moving and pushing yourself further and further. And with each new achievement, you have to keep adjusting your goals and establishing new milestones. In business, the strategy has changed and it is no longer about just research and development. This part includes better marketing campaigns, improved leadership, skilled employees, etc. And with each new milestone achieved, every new mountain climbed, every shot you take, comes the next milestone, the next mountain to climb, the next shot to take. Because at this point, there is no stopping and your dedication, passion, and mission supersede any obstacles, threats, and shots thrown at you. But how do you know that you have the best intentions? What are the best dreams? And how can you sustain and keep them alive? This is a topic, we have discussed in a series of posts on our social media and would like to invite you to go engage with our posts on our Instagram, Facebook, etc. Also we will be going over dreams one more time in an upcoming article with an entrepreneur that has gone through tough times and overcame them by focusing on the dreams and on their future. You want more from life, don’t you? If so, I am sure you have a lot of dreams. Dreams are great. They give us a depiction of the future we wish for ourselves and put us on a path towards our goals. That is if we want to do something about them of course. Most people don’t do much towards making sure their dreams become reality. Wondering why? Because it is comfortable to stay in the same position you’ve been in the past couple of years. To have a different lifestyle, you have to change and become someone new. It will be hard and will require persistence, patience and determination but if the need outweighs the risks then that will be the start of your journey. So what are your dreams? How do you stay motivated? What drives you forward? How do you invite others on your uncertain journey? Share your thoughts below with us. If you have a story to share or know someone whose story belongs here, please refer them to us and when you refer a client to us for our different marketing and website services, you can make money through our affiliate marketing program. Stay tuned. See you at the top. Stay AFRAIDD. Leave your thoughts in the comments and subscribe for upcoming articles about businesses and entrepreneurs shared through The African Boss Magazine and The African Boss TV. We also welcome businesses and entrepreneurs’ stories so if you would like to share, please set up a time to do so through the popup provided on this page. Listen to Coach Bomb talk about the Success Blueprint or The Playing Afraidd blueprint in this short video below.